It's Bedlam in Britain. Facts Can Calm Things Down. The UK’s vote to leave the EU has fomented widespread uncertainty and fuelled doubts about the nation’s economic prospects and political future. It’s unclear when, and even if, the government will trigger Article 50 of the Lisbon Treaty and begin its exit from the union. Moreover, the ruling Conservative Party has been divided by the EU referendum and thrust into a leadership crisis following Prime Minister David Cameron’s announcement that he would step down by October. Quelling the confusion and restoring confidence will require a clear strategy and a focus on the facts, rather than the emotional rhetoric that defined the Brexit debate. 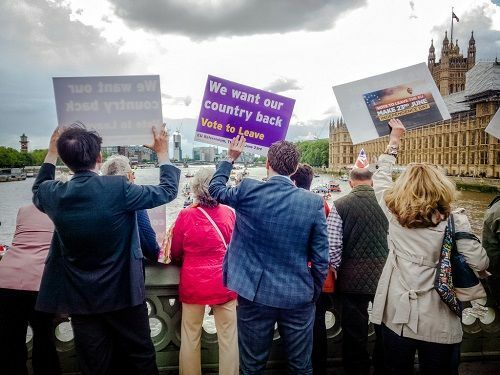 Ex-Mayor of London Boris Johnson and former UK Independence Party leader Nigel Farage - two prominent Leave campaigners – have both taken a step back following their unexpected success. The pair have backpedalled on several of the campaign’s biggest promises: that an exit from the EU would free up £350m a week for the National Health Service (NHS), and allow the UK to radically reduce immigration. Remain proponents have also jumped ship in light of the result. Chancellor George Osborne has embraced Leave ideology in a bid to save his position. He claimed the UK economy would stabilise following the Brexit vote; the pound has plunged to a 31-year low and stock prices have been hammered. Meanwhile, Theresa May - now a frontrunner for leadership of the Conservative party - has refused to comment on whether EU migrants will be allowed to live and work in the UK. May and Osborne’s flip-flopping may protect their careers, but it’s unlikely to shore up public trust in the UK’s leaders. The rival Labour party is also divided; MPs have resigned en masse to show their dissatisfaction with leader Jeremy Corbyn, who refuses to step down and still has the support of trade unions, some of the party's main financial supporters. There’s also an ideological rift between those who embrace the party’s socialist grassroots and more business-focused New Labour supporters. The nation's new leaders, whoever they may be, must act quickly to quell political uncertainty and draw up a plan for Britain’s future. Firstly, they should address one of the public’s key concerns and a linchpin of the Leave campaign: immigration and its impact on jobs and public services. The government has refused to comment on whether EU migrants who reside in the UK will be allowed to remain, or provide hard facts and statistics on whether a stricter immigration policy would help or harm the economy. It’s also unclear whether UK ‘expats’ living in the EU will be forced to return. The frontrunners to replace David Cameron have shied away from outlining clear policies or committing to specific action. But clarity is exactly what the UK needs to overcome the current instability. May and Andrea Leadsom, who are vying to become Prime Minister, shouldn’t feel compelled by the public’s vote to immediately clamp down on immigration. First, they should commission and publish extensive research and data about the impact of immigration on the UK. They should also reassure, or break the news, to EU workers and businesses in the UK about their futures. In a period of immense upheaval, confusion and polarisation, facts should take centre stage.